Guideline consultant and casting ace, Klaus Frimor, has confirmed his attendance for the GAC Open Weekend on March 2nd, 3rd and 4th, 2012. Since the age of 5, fishing has dominated Klaus Frimors life. He grew up in Denmark, and in the beginning, smaller lakes and streams were the target for his adventures. Later on in Sweden and Norway fly fishing for Trout, Salmon and Pike became his main interest. At the age of 19 he joined the army hoping to be posted at the NATO airbase in Jutland, since the best Sea Trout river ran right through it. After finishing his service he joined the tackle trade, working for the largest retailer in Denmark. During the 5 years he worked in the shop, he met the legendary fly caster Göran Andersson, who took him “under his wing”, and taught him the foundation which would leave him to even larger adventures. Then Klaus had the opportunity to travel to Iceland, a country he immediately fell in love with, and when offered a guide job, it didn't take him long to accept! The following winter he was guiding in South America where he later became the lodge manager and host. 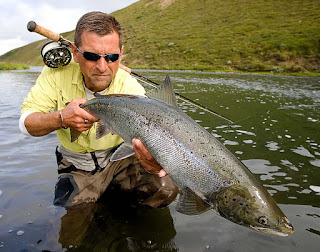 Klaus was probably the first foreigner to flyfish Lago Strobel (also known as Jurassic Lake) in Argentina, catch King Salmon on a fly rod in Rio Serrano in Chile or Rio Catarina in Argentina, places few people had heard of, even less fished! Spending hundreds of days on the river, either fishing or guiding, led to a job developing rods and lines for Guideline and demonstrating fly casting at shows all over the world is now a large part of his life. He is also a sought after instructor for casting clinics and guiding services. He will be with us all weekend, giving advice on gear selection and casting as well as give some great demonstrations and telling a few of his amazing stories from around the world! This will be his first GAC Open Weekend so we hope you will all come and give him a warm welcome!